After surviving a stroke, your elderly loved one has a different set of care priorities. Maybe your mom or dad has lost mobility after being partially paralyzed, and the need for your assistance has spiked considerably. At first, perhaps you were only needed for basic needs like grocery shopping. But after a stroke, your aging senior requires more intensive support. He or she may need help with personal care like bathing and grooming. And as you manage your own household and career, caring for Mom or Dad can quickly get out of hand. In a healthy brain, blood flow delivers oxygen to its cells. But during a stroke, the brain’s blood supply gets temporarily cut off. The shutdown causes vital brain cells to die. The brain damage leads to loss of control over memory and muscle movements. Be prepared to provide extensive care for your recovering loved one. Care in the aftermath of stroke can quickly become much harder than you think. You will have to plan the logistics for your senior's basic routines. The stroke survivor may need help with everyday activity: showering, dressing, eating, bathroom breaks, basic communication. He or she quickly becomes utterly dependent on you. Meantime, as difficult as it may be, you must be prepared should your elderly loved one remain permanently impaired. “Some people recover completely from strokes, but more than 2/3 of survivors will have some type of disability,” according to the National Stroke Association. Your elderly loved one wants to stay in the comfort of the home and age in place, but the road to recovery can be daunting. Because of the physical changes that occur in the brain after a stroke, survivors may experience increased levels of anxiety, anger and depression. And you may not be equipped to deal with the intense negative emotions afflicting your stroke survivor, making an already difficult task much harder. Recovery for a stroke survivor is a lifelong process. It’s a myth to think the survivor will make a rapid recovery, per the National Stroke Association. Stroke ranks fifth as the leading cause of death in the U.S. and is a significant cause of severe disability for adults, according to the Centers for Disease Control and Prevention. The care decisions you make for your elderly loved one will determine the trajectory of the healing process. But what’s most important here is the grim reality. When your senior loved one has a stroke, the need for constant care can radically intensify. When your loved one has suffered a stroke, professional home care service can be an enormous help. A professional caregiver can fill in the gaps for daily personal care. Without hygiene assistance, your senior stroke survivor may remain less able to bathe or get dressed properly. But a trained professional has the skills to restore dignity to daily self-care for your recovering senior. “Home care complements existing health care services, alleviating pressure on the overall system, allowing more traditional models of care to work and do what they do best,” according to a joint report by the Home Care Association of America and Global Coalition on Aging. Should the stroke survivor show symptoms of a health issue, you will be promptly notified. The professional caregiver performs only non-medical duties; however, the skilled assistant can be the first to notice signs that something is wrong and call for help. It's peace of mind you can't get any other way, especially considering the heightened difficulty of your loved one's care. The help a home care provider offers goes beyond physical tasks, too. For example, after a stroke, your elderly loved one may have more difficulty speaking because of facial paralysis. During this time, it’s helpful to show the stroke survivor ways to stay connected. An experienced caregiver can practice online social skills with your senior to help him stay connected. 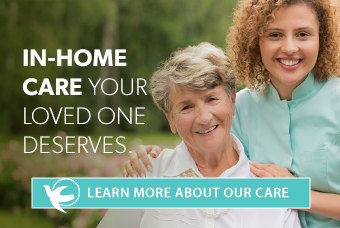 Now that you know the benefits of a professional caregiver, it’s time to share with your elderly loved one. And if you feel worried that he or she may resist outside help, don’t get discouraged. Start off with an open, casual discussion. Click here for some useful conversation starters.